Violent delights do have violent ends, at least when it comes to Westworld season 2. The second-to-last episode of the series just showed itself to us and, to be frank, it was one of the most hopelessly dark episodes of the show to date. Still, it brought with it a good deal of violence, reveals and helped set the stage for what's to come in the season 2 finale next week. Let's dig in, shall we? Vanishing Point really left us with two big questions in my mind; what exactly are we going to find at the Valley Beyond and, oh my god, is William (Ed Harris) a robot or not? That final shot of him broken, defeated and sick to his stomach with himself, after living a life full of games and lies just digging in his arm for answers, turning the violence on himself for once, left us with a burning question and a bad feeling in the pit of our stomachs. William's past was further revealed in this episode. After being rescued by his daughter Emily (Katja Herbers), she and William have a deep chat about the night Juliet (Sela Ward), aka William's wife and Emily's mother, died. Via a series of flashbacks, we get a look at that tragic night. Juliet had become an alcoholic after years of realizing she was living with a phony. Ford (Anthony Hopkins) gifted William with some information on a futuristic flash drive of sorts. William hid it in the bedroom and, after giving a deeply honest, heartbreaking speech to his wife, which may have been one of the best moments of the season, giving her something truthful to chew on, she discovers the drive, containing all of the dark things William has ever done. This is the last straw for her. Meanwhile, Emily and William are having a talk downstairs, discussing what to do with Julia. Emily wants her to go to rehab, William doesn't think it will help. Then the water drips on the table. That bathtub shot we've seen all season comes full circle. Julia could no longer live the sham of a life she's been living. William may not have pulled the trigger, but he's definitely the one that killed her. What's perhaps most gut-wrenching is that Emily saved her dad and seemingly wants to try and salvage a real relationship, despite having ulterior motives centered on his "secret" resurrection project. Perhaps no moment beeter encapsulates William than when it is said, "You are, in your very essence, a lie." Years of this madness have caught up with the Man in Black as we know him and, once the cleanup crew arrives, it hits the fan. He kills several real-deal, red-blooded men, to which his daughter reacts as one might expect. But William wasn't convinced that Emily was actually his daughter and he shot her too. But alas, this was not one of Ford's games. Emily is not a host. So, William finally broke himself and became the kind of man that would kill his own family. Dark, Westworld, even for you. Elsewhere, but still lost in the darkness, to be sure, we catch up with Bernard (Jeffrey Wright) who was spared after dishing all of the info he had to Charlotte (Tessa Thompson). She is trying out Maeve's (Thandie Newton) powers with another host, namely Clementine (Angela Sarafyan), who apparently isn't as dead as we may have thought. Bernard is still with them, watching on in horror as the hosts tear one another apart in horrific fashion as the demonstration of what these powers can do in the company's hands is played out. Maeve's code works quite well and that means they may not have any use to keep her alive. Ford is still very much in Bernard's head at this point. They go to Maeve, who is still miraculously alive, but worse for the wear. Charlotte doesn't intend to keep her around much longer, now that they have the code. Ford left Maeve a message that he makes Bernard deliver through that weird robot telepathy. The message is revealing and heartfelt. Maeve was his favorite host. It was as close as he got to a child. Before departing, Ford unlocked some code for his favorite robot. We have no idea what that code did, but we're guessing that's going to result in some violent behavior from our dear friend Maeve. Elsie (Shannon Woodward) is clueless as to Ford, but Bernard explains that the park has been replicating guest's minds, which he learned recently for himself. Now they're in the race for the Valley Beyond. Bernard tries to get Ford out of his head while Elsie is distracted gathering ammo because, well, he didn't want to kill Elsie even though Ford wanted him to. After seemingly being rid of Ford (but probably not), Bernard leaves Elsie to try and save her, but she doesn't understand. She can't understand. Bernard is off to the Valley Beyond on his own. One of several dogs in the race. Lastly, we catch up with Dolores (Evan Rachel Wood), Teddy (James Marsden) and their gang, who met up with the Ghost Nation. Things got bloody fast. The battle resulted in everyone dying, mostly everyone anyway. It's just Dolores and the Teddy monster on their way to the Valley Beyond. Or so we thought. The pair stop for a bit to take in the sights and, as we saw alluded to when he let the member of the Ghost Nation live, Teddy has been contemplating what he's become. Teddy, whilst staring at the not-so-natural beauty the park has to offer, begins waxing philosophically about their nature and his relationship with Dolores. Then he kills himself. No more backups. No nothing. He's dead for real. In a season full of holy s*** moments, this was up there. Using their love against her, Teddy took his own life, knowing he could never harm his love. He'd rather do this than become as bad as the people who built them. Actions have consequences, Dolores. So where does that all leave us? The finale will take us to the Valley Beyond. Dolores, Charlotte and her team with Maeve's powers, Bernard and possibly William are all going to be converging at the same place. Who will get there and what will they find? Safe to say, it's going to be a big finale, or so we hope. 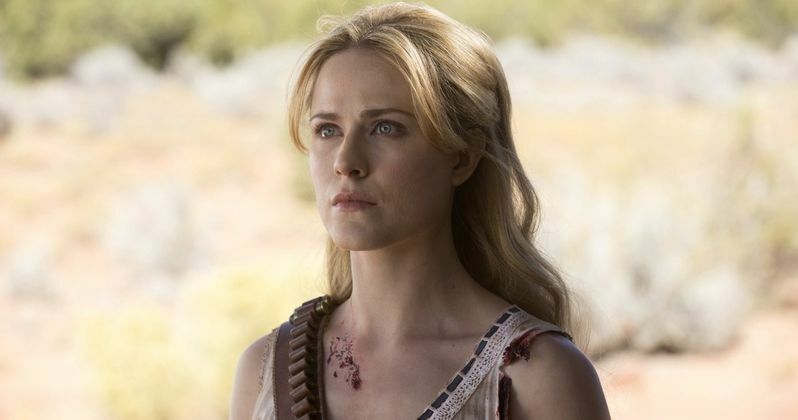 The Westworld season 9 finale airs Sunday on HBO.